Workers at the giant Haft Tapeh sugar cane plantation and mill complex in the southern city of Shush have always had to fight for their wages and their rights. In 2008, workers formed an independent union - affiliated to the IUF - following a 42-day strike to demand long-standing wage arrears. Union leaders have endured arrest, prison and blacklisting. The workers and their union again face repression as they demonstrate to claim massive wage and benefit arrears. Conditions have worsened since the company was privatized in a murky deal in 2015 whose details have never been fully brought to light. Since October last year, workers have had to repeatedly hold strikes and demonstration to demand payment of wages and benefits, most recently in June this year. Thousands of workers have not been paid their wages for two months and as many as four. Pension benefits have been suspended in recent months because of the company's failure to pay into the state social security scheme. Over half the plantation and mill workers have no permanent employment contracts and live in permanent insecurity. Current and retired workers and their family members have been harassed and threatened with closure of the company if they continue to demand their rights; workers are routinely harassed, dismissed and kept under constant surveillance of the security forces. 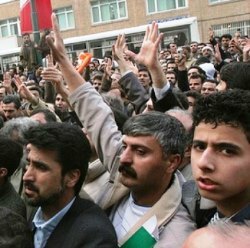 The Haft Tapeh workers and their union are demanding full payment of wage and benefit arrears; recognition of the union as the workers' legal representative; and the company's return to government ownership. Use the form below to send a message to the Iranian authorities in support of the workers' demands.